4 years ago today a 13-year-old me made a batch of snickerdoodles and a WordPress account and hit “publish” on her first ever blog post. Now, this website that started as a way for me to funnel all of my free time and baked goods into something productive has evolved into what can only be described as an integral part of my life–however clichéd that sounds. Because of the infamous (but nearly complete at this point!) college process, I’ve thought and written and spoken a lot about this whole blog thing in the past several months; and because of that, I’ve gained a true appreciation for this space I’ve created for me and you. I love knowing that this space, so long as I continue to pour myself into it, will remain constant no matter where I end up for the next four years, and every year after that. It’s pretty hard to believe that a year has passed since I made that chocolate cake with marzipan buttercream for C&N’s 3rd birthday (speaking of which, did I mention that Molly Yeh mentioned me and that very buttercream in a recent post?) These past 12 months have been tumultuous, exciting, difficult, and wonderful all at once. I’m just now checking off the last boxes on a to-do list that seemed never-ending just a month or two ago, and my life is slowing to a more manageable pace for the first time in a long while. The rest of this school year will bring with it its fair share of endings; but for every last high school dance, or final softball game, or graduation ceremony, there are a zillion new beginnings. It’s terrifying, yes, but so, so exciting–at least that’s what I’m telling myself. For this year’s blog birthday, I didn’t make a cake. Instead, I opted to follow inspiration where it led me and wound up with something that happens to sum up a lot of what I’ve loved about the baking world as I’ve grown older. I wrote in my last post about the evolution of my approach to recipes–that is, that I was once a word-for-word recipe-follower but have slowly become comfortable enough with my medium to start using different sources and inspirations in creating recipes that are distinctly mine. That notion of room for growth, for improvement and change, is one of the things that draws me to baking, as is the unique combination of technical skill and creativity that work together in creating the layer cakes and macarons and galettes that inhabit my site. And now on to this recipe (finally, I know). I got the idea for these bars on a flight home from Florida, key lime pie still fresh in my mind. I first thought to make a grapefruit pie in the same style, but decided to go with lemon square-like bars. I did my research while standing at baggage claim in JFK, and while my parents worried about our luggage I stood worrying whether or not my bars would set given the comparatively lower acid content of grapefruit. 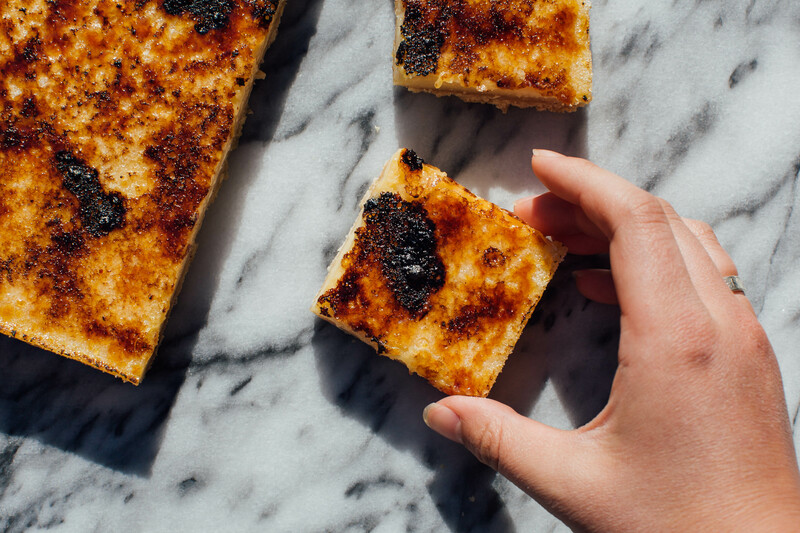 But the bars set beautifully when I made them the next day, and were made even better by the addition of a brown butter crust and brûléed sugar topping. These are so easy and so good that you don’t have much of an excuse not to make them your Sunday baking project… if for nothing else, bake them because it’s my blog’s birthday and I told you to. Here’s to 4 more years! 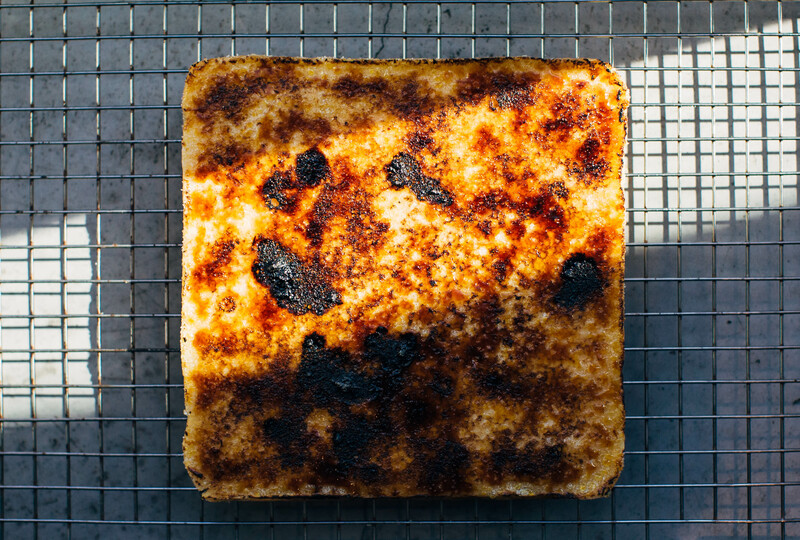 Heat the oven to 350 F. Line an 8-inch square pan with aluminum foil, then lightly grease it. First, make the crust: Melt the butter in a medium saucepan over medium heat, stirring constantly. Keep cooking and stirring until the milk solids turn golden brown and the butter smells nutty. The butter will foam first, then the foam will subside, and then, after a bit, it will turn brown very quickly. Make sure to take it off the heat before it’s too dark, as it will continue to cook a bit until you remove it from the pan. Once it’s browned, pour it–browned milk solids and all–into a bowl and allow it to cool slightly. Once the butter has cooled, stir in the 1/4 cup granulated sugar, vanilla, and salt. Add in the 1 cup of flour and stir until just combined. Press the dough gently into the bottom of the prepared pan. Bake for 20-25 minutes, or until the crust is golden brown. While the crust bakes, make the filling: Stir together the flour, sugar and salt in a large bowl, then whisk in the eggs, then the grapefruit zest and juice. When the crust is golden, turn the oven down to 300 F. Slide the oven rack out and pour the filling onto the hot crust. Slide the pan back in and bake for 30-35 minutes, or until the filling is set and no longer jiggly when the pan is tapped. Cool completely on a wire rack. Once the bars are cooled, sprinkle the top generously with granulated sugar. 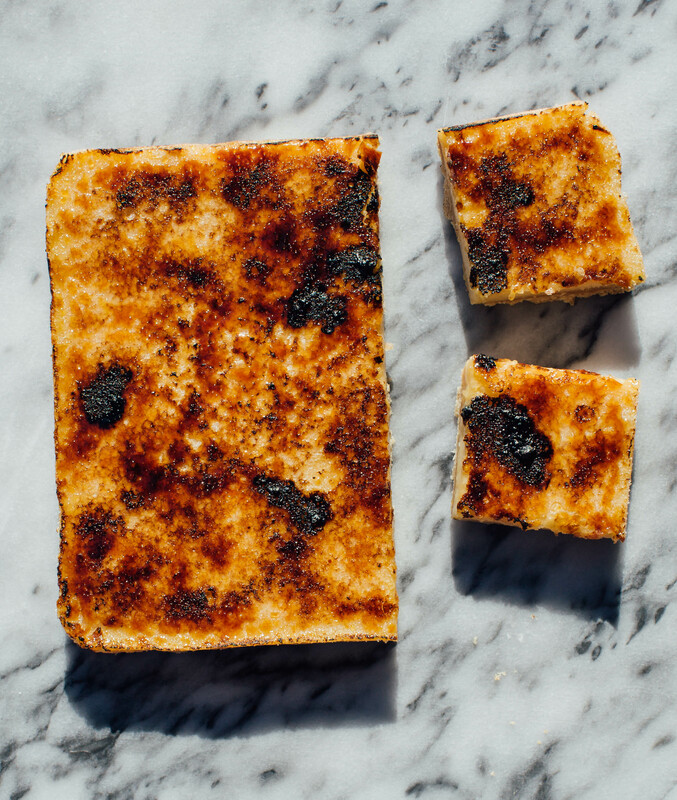 Use a blowtorch or the broiler setting of your oven to melt and caramelize the sugar. Allow to harden, then use a sharp knife to cut into squares and enjoy! 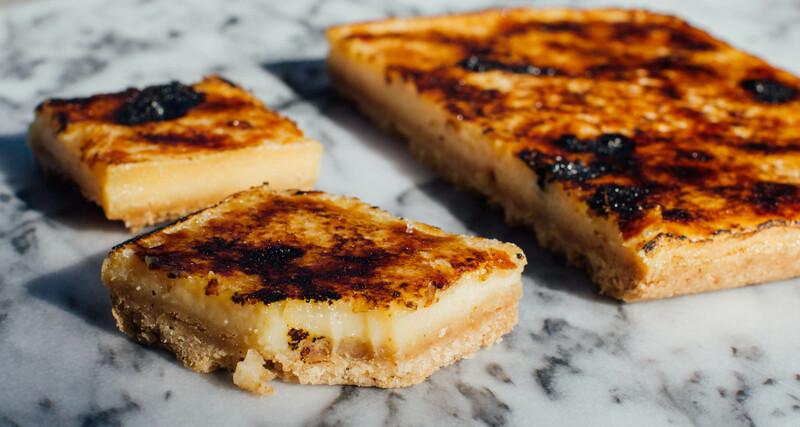 Love brûlée and this looks like such a great combo! Never thought of grapefruit bars!! Glad you are still baking and blogging, Alaina — even during the college app process, which I know will end well.